Fifteen-year old Genna Colon believes wishes can come true. Frustrated by the drug dealers in her building, her family’s cramped apartment, and her inability to compete with the cute girls at school, Genna finds comfort in her dreams of a better future. Almost every day she visits the garden and tosses coins into the fountain, wishing for a different life, a different home, and a different body. Little does she know that her wish will soon be granted: when Genna flees into the garden late one night, she makes a fateful wish and finds herself instantly transported back in time to Civil War-era Brooklyn. How did we get this book: Thea received a review copy from the author, Ana borrowed hers from a friend (thanks, Karen!). Why did we read this book: We follow Zetta Elliott’s blog and articles on Diversity. When we organized YAAM, we decided it was time to read her novel. Ana: I started reading A Wish After Midnight one night and didn’t stop until I finished it. The important thing to say is how I might have finished the book but was not done with it or rather the book was not done with me: I lay awake that night thinking about it and about the history, the story, the text and the subtext, the characters until I could think no more. I loved it. Thea: I gotta agree with Ana on this one – I loved A Wish After Midnight. This is a beautiful character-centered book about a girl struggling to survive in two different eras, dealing with racism across two distant – but not so different – time periods. Zetta Elliott’s writing, plotting, and characterizations are flawless, and – well, how else can I say this? – I LOVED this book. Ana: A Wish After Midnight is a semi-fantastical account of Fifteen-year old Genna Colon’s life. The year is 2001 and Genna lives in Brooklyn with her family – her mother and three siblings. Genna is Panamanian/African American and her dad went back to Jamaica a few year back after being disillusioned with racial inequality in America. The first part of the book follows Genna in her daily life in a small apartment in a run-down building , dealing with racism, poverty and the expectations of her mother who hopes she will do better one day. Genna spends her day studying, taking care of her small baby brother, developing a relationship with an African-American boy named Judah and often visiting a public garden in Brooklyn where she eventually meets Hannah, a white woman who hires Genna as a baby-sitter.It is in one of those visits to the garden that Genna makes a wish to the fountain and ends up in the past – back in a Civil War-era Brooklyn. Thus begins the second part of the book as she wakes up in the past in the body of a slave who had been recently published – as the slashes on her back prove. Confused and in pain, Genna is rescued by a quick-thinking, emancipated slave who was nearby and taken to an orphanage where she will recover from her injuries and then try to find a way back home. A Wish After Midnight is a wonderful, vivid story. I love for example, how the details regarding Genna’s wish and how exactly she ended up in the past are up to the reader’s imagination because after all this is not what the story is about. Rather, it is a character-driven book in which Genna’s resilience and observation of the world are what really matters. Slavery is a loaded issue and I thought the author handled it very well, and not heavy-handed at all. In fact, the plot is a subtle representation of slavery: by taking Genna from everything she knows and loves and thrusting her in a situation of which she has no control of, therefore re-living what her ancestors went through , with an obvious difference: a 20th century sensibility. This shift demands a lot from Genna but her keen eyes don’t miss anything. And she is lucky too, as she is sent back to NY and not a southern state and a NY on the brink of the Emancipation Proclamation and the New York Draft Riots. The author is very deft at incorporating Historical events and the Brooklyn setting is incredibly realistic and the story is also a tale of two cities – of two Brooklyns separated in time. It is less about a cohesive plot of a time traveller and more like an exploration of what if feels like to be a black girl in Brooklyn in 2001 and in the 1800s. It simply astonishes me that with this writing and this story the author was unable to secure a publishing deal and ended up self-publishing. Thea: What Ana said. A Wish After Midnight is much more of a character-piece than a rollicking time travel novel, but that doesn’t mean that the plotting isn’t superb. The time/world-traveling teen conceit is a familiar one (one of my favorites and a book that Wish reminded me of is Jane Yolen’s The Devil’s Arithmetic, in which a teen jumps back in time to the Holocaust – and of course there will always be the comparisons to Octavia Butler’s Kindred), and Ms. Elliott does it brilliantly, putting her own spin on this familiar plot trope. First, Ms. Elliott brings to life Genna’s world in modern day Brooklyn, detailing her separated and struggling family, the grime and danger of a life in the projects but also Genna’s love of her siblings and mother, her books, and the lush botanical gardens where she goes to escape fetid reality. When Genna awakens in 1863, in a beaten body on the eve of the Emancipation Proclamation, she may still be in Brooklyn, but it is an entirely different world. With equal care and attentiveness to detail, Civil War New York is brought to vibrant life too, as Genna is first brought back to health and then works as a nanny in Dr. and Mrs. Brant’s home. The political landscape and the historical detailing is impeccable (author Zetta Elliott holds a Ph.D. in American Studies), creating a very real, tumultuous picture of a major city on the brink of war. The most intriguing thing about A Wish After Midnight, and what makes it stand out from other so-called time travel historical fantasy novels, in my opinion, is how the book (through Genna’s eyes) examines race and identity over two very different time periods. In modern Brookly, Genna’s mother has an instinctive mistrust, even hate, of white people – which isn’t without grounds, considering the interactions that Genna and her family have every day. Genna’s boyfriend, Judah, is resigned that he will not learn anything in American schools and is determined to move to Africa. In contrast, Genna isn’t comfortable lumping together all white folks into the same generalization as her mother does, nor does she think Africa is the solution to all of life’s problems. And then, Genna jumps back in time, and experiences the world from a completely new perspective – as an assumed runaway female slave, vulnerable and utterly alone. There’s danger aplenty in Genna’s worlds – both in modern Brooklyn (one story Genna relates about a girl that was raped in a staircase at school is particularly chilling) and past Brooklyn, where being black – being a black woman – is incredibly dangerous. But more than just an examination of racism, A Wish After Midnight is a book about Genna discovering and feeling comfortable with herself. But more on that in a bit. Ana: It is in the characterisations that I think A Wish After Midnight excels. All of them to some extent or another, but especially Genna. It is Genna that carries this book on her back and her voice is simply one of the best narrative voices I have read in YA. From her relationship with siblings for example (her eldest sister is often seen as evil as most older sisters are – my baby sister will probably tell you the same when she recollects our childhood, I am ashamed to say) to he relationship with her mother. She is extremely keen observer of her environment and I love how her views of both white and black people are balanced – white people are not all devils even though she feels and sees racism every day of her life. She navigates the sometimes hazy waters of an outlook that has shades of grey instead of being black and white. She is resilient, proud, inquisitive and fair. I absolutely loved the diversity of the characters especially the ones back in the 19th century from her white employees to her black comrades. The former are good people yes and abolitionists but their views are often patronising and insulting. As for the latter, some of them feel justifiable anger and resentment but they all react in different ways and it is all part of the different experiences – and none of them are presented as being wrong or right. They are all possible reactions, part of perfectly legitimate responses to racism and poverty. Genna’s mother is fast in hating white people for example and Judah’s answer is to want to go back to Africa. Speaking of Judah, I don’t like Judah as her romantic interest simply because I don’t like the way he usually treats her. But I like their interactions and how they discuss things and many times disagree and this discussion is rich in providing different sides of a debate. Judah is an interesting character and a perfect counterpoint to Genna – whereas he wants to go away and start anew, Genna still wants to make America her home and a home that would welcome everybody. In the end, I cared deeply for these characters and hoped for the betterment of their lives – anywhere in time. Thea: As Ana says above, this is truly a character-driven book. It is because of Genna that A Wish After Midnight shines so brightly – because of her keen, observant, even lyrical narration. Her interactions with her family (especially with her mother and her youngest sibling, Tyjuan) are moving and genuine, as is her relationship with Judah. It’s the little things that Genna says – her observation about girls wearing contact lenses, her likening her newly coiled and dreadlocked hair as seedlings needing to be tended – that are so memorable. But beyond Genna’s skill as a narrator, she’s also a girl that sees herself as awkward and unattractive, picked on at school and by her own older brother and sister. Her remarks about her own looks, her insecurity about her hair and about how tall she is, it’s relateable – and it makes A Wish After Midnight also a story of self-discovery, and identity, as Genna becomes comfortable in her own skin. While the other characters are detailed and vivid – from Genna’s hardened mother to the cruelty of Mrs. Brant (what a terrible woman! ), this really is more than anything else, Genna’s story, and she steals the show. Ana: A Wish After Midnight is wonderful book that made me think, made me feel. I loved the writing and most of all I loved Genna’s voice and her portrayal as a strong, proud, resourceful young girl. Thea: This is a beautiful novel, and one that I wholeheartedly recommend to readers of all genres, backgrounds and ages. 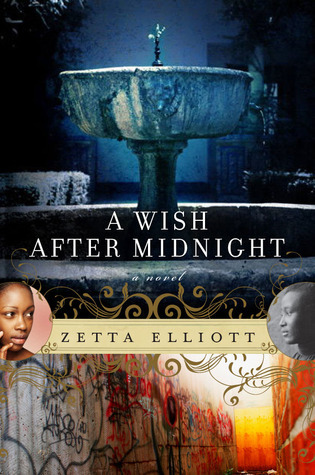 Poetic, poignant, and memorable, A Wish After Midnight is a book that lingers with you long after the last page, and I cannot wait to read more from the talented Zetta Elliott. It’s ok that Hannah wants to help me, but I don’t need her to help my family. I don’t need her to put clothes on my back, and I definitely don’t need her to dress my mother. Sometimes people give you things, and they don’t know when to stop. They give too much, ’cause they want to fix all your problems, but sometimes you got to fix your own problems, your own kind of way. Hanna’s already paying me, and that’s what I said. Additional Thoughts: Be sure to stop by tomorrow: Zetta Elliott will be here with an article on diversity in YA! I’m looking forward to Zetta Elliott’s post tomorrow. I’m glad you didn’t spoil it. Would surely find some time to read this book. Based on your review, it seems like a very interesting thing. Reading books is my hobby. Thank you for sharing this nice review to all of us. Reading your review made me feel interested with the book. I LOVE this book so much. I’m thrilled that everyone is discovering it! It’s mindboggling that Zetta had to self publish it first. I’m so so glad that she did. The book is quite interesting. I like the story behind how you discovered this book. Will surely read this book! I Will find some time to read this book. Based on the review, it seems like a very interesting thing. Erin, you are a much stronger woman than I! I would never be able to eat what you are eating for 4 days! I am excited that you get some veggies soon as that will be good for you, and tasty too! I especially enjoy your honesty, and that I can vision you throwing your spoon on the ground in “frustration” Hope today is a great one!